Is Chrysler Secretly Developing A Hellcat-Powered 300 Super Sedan? Would it even be for the US? Aside from the all-new Pacifica minivan, Chrysler hasn’t been up to much lately, other than killing off the 200 sedan. As for the larger, rear-wheel-drive 300 sedan, it has, more or less, been left untouched since the SRT trim was discontinued back in 2015. But Autoblog recently got a hold of some spy shots of a 300 test mule that might just indicate Chrysler has something planned for this Dodge Charger corporate twin. Could a new 300 SRT be in the pipeline? Possibly. The 300 test mule (not pictured) is wearing a set of 315-mm tires, which were also worn by early Dodge Demon prototypes. Because of the wider rubber, the wheels stick out further from the wheel wells, thus making it likely Chrysler will tack on wider fender flares to cover the tires. Also spotted on this particular 300 mule were four-piston Brembo brake calipers, similar to those on the 300 SRT. Autoblog’s spy photographer also claimed this 300 sounded like it had a supercharged Hellcat V8 under its hood. So how can this all be interpreted? Here’s our theory: Chrysler is prepping a 300 Hellcat for the Australian and Middle Eastern markets. The Dodge brand isn’t sold Down Under, and we all know the Aussies love themselves lots of horsepower. A Hellcat-powered 300 would be the ideal consolation prize due to the lack of Charger Hellcat availability. Ditto for the Middle East, a region where the Chrysler 300 SRT is still on sale. It’s apparently selling well enough, and dropping a Hellcat V8 under its hood makes complete sense. 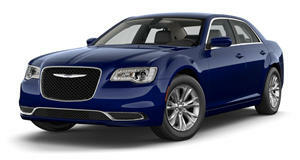 Sadly, however, we predict the Chrysler 300 US lineup will remain as is until the sedan is retired.